(CNN) -- There is a well-known saying in Afghanistan: "You can rent an Afghan, but you can't buy him." "So long as the Americans are keenly aware of this, you're buying a very, very, very temporary allegiance," he said. "If that's the foundation for moving forward, it's a shaky foundation." The bill comes as an uptick in violence claimed the lives of several American troops in Afghanistan over the past few months. In the most recent attack on Tuesday, eight soldiers were killed in what officials are calling a well-coordinated attack in southern Afghanistan involving improvised explosive devices and small-arms fire. CNN Security Analyst Peter Bergen said the idea of offering amnesty to Taliban members is nothing new -- but paying them is. "There's been an amnesty program for low-level Taliban in place for many years now and thousands of people have taken advantage of it," he said. "So this is not entirely a new idea. The idea of bribing people, local guys, to come over. ... It's one of the most cost-effective ways to get people to lay down their arms, either to negotiate a peace or coerce them." Levin touted the plan, using the 'Sons of Iraq' plan to drive home his point. "Large numbers of young Iraqis, who had been attacking us switched over to our side and became the 'Sons of Iraq,'" he added. "They were drawn in part by the promise of jobs and amnesty for past attacks, and in part by the recognition that the status quo was creating horrific violence in their own communities. In their own interests and the interests of their nation, they switched sides and became a positive force." But Bergen argues the comparisons are not analogous. "In Iraq, they turned their guns on al Qaeda in Iraq, which was a foreign-led organization that was imposing Taliban-style rule. And that didn't go down very well with the local Iraqi Sunnis," he said. But in Afghanistan, "The Taliban is the guy you grew up with. They're not some foreigners who came in and to be part of the jihad. ... 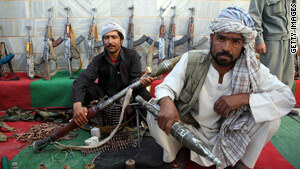 The values they [Taliban] have are not far off from what rural Pashtuns have." He added that al Qaeda in Iraq made a lot of mistakes - which was instrumental in getting Iraqis to "switch sides and get on the American payroll." The top commander in Afghanistan has backed the plan for the Taliban. "Most of the fighters we see in Afghanistan are Afghans, some with [a] foreign cadre with them," said Gen. Stanley McChrystal in a July 28 Los Angeles Times interview. Most are not ideologically or even politically motivated, he said in the interview. "Most are operating for pay; some are under a commanders charismatic leadership; some are frustrated with local leaders." CNN's Thomas Evans, Adam Levine and Nic Robertson contributed to this report.